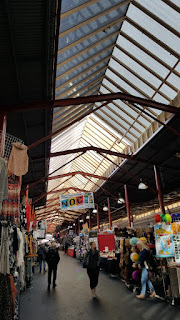 11/4/2019 12:32 - "We the traders in the eastern side of the J shed would like to bring to the attention of the management that the shade cloth which was removed from glass has been done without any information or consultation with us. removing the above shade cloths is severely affecting the health of the traders and their employees, discolouring and in some cases melting the products and making them worthless. Also very impotently the customers are getting frustrated with the sun rays and leaving the stall without even looking at the merchandise. I hope the management come themselves and see this problems facing the J shed traders,and put the shade back on the glasses. We were told that it has been removed for the winter months, but the sun rays is getting so harsh even in winter, that some of the traders are getting sick and head aches including the other problems mentioned above. " Thank you for your comment - Ed.